You may remember my post, where Google and Nestle has launched a contest on 27th September, 2013. Nestle in association with the Google was giving out free Google Nexus 7 on the hour every hour to Indian participants for promoting Googles launch of Android 4.4 KitKat. Well, I had to buy the Nestle's KitKat for making the blog post regarding the contest with a step by step tutorial and surprise surprise, I won a Google Nexus 7 on 17th October 2013 with the Nestle's KIT KAT I bought. I will get delivery of my prized Google Nexus 7 after 15th November, 2013 when the contest closes. My congratulations to those of other 640 lucky contestants who have won the Google Nexus 7 as of today. For the others I would like to bring to notice some salient requirements of the contest which the Google KitKat Terms and Conditions page doesnt mention. This message will be received by all of those who participate in the contest. The key is the second message which is received within 10 to 15 minutes of the first one. If you receive the second message which is as below, provided your documents are in order, Congratulations, you have won a Google Nexus 7. Thanks for your participation in the Kit Kat Program. You shall be contacted within 24 hours by our representative. Kindly retain the wrapper. Visit www.android.com/kitkat for T&C. Once you get this message stay close to your mobile phone, dont make unnecessary calls and wait for the Kit Kat representative to contact you. First and foremost she will ask for the wrapper code. Then she will proceed take down all your details and ask you your email id. Kindly spell out the email id to her and make her repeat this email id. Once she says Congratulations you have won the Google Nexus 7, your name will be listed on the KitKat contest page. You should send the documents within 7 days from the date of second call by courier or registered post. I sent it across through Bluedart, as Bluedart is fast and has a good tracking service. Reading my post, many of my friends and colleagues participated in the contest and as of today 3 of us have won including me. If you are still interested, there are around 320 Google Nexus 7 left still to be won and the last date is 15th November 2013. Head over to the post here for details. If you have any query regarding the procedure kindly leave your question in the comments box and I will answer to it. The contest has closed today and there are lots of happy faces for winning a new Google Nexus 7 2013 while some are heart broken. 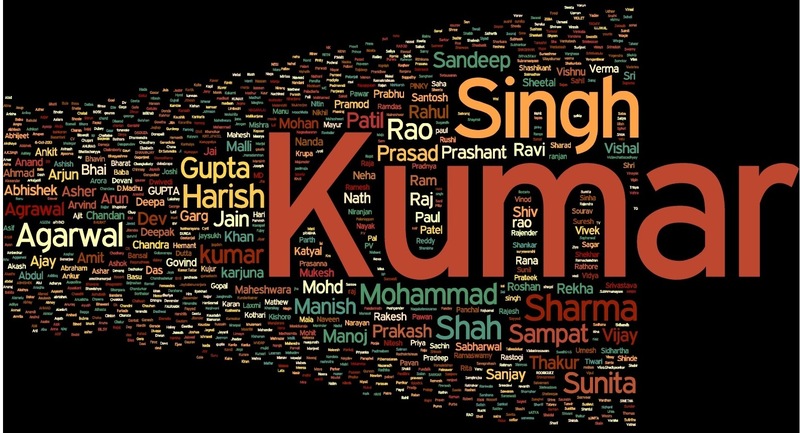 A reader of the Blog has made a special names cloud of the Winners names which I take the pleasure of putting up on my blog. The blogger has a limitation of 200 comments, hence you are requested to kindly press the 'load more' button beneath the comment box. This will launch the 201 comments onwards without reloading the website. Thanks for reminding about this contest! I did have info of it, but I had forgotten! Let's see if time permits me to take part in it! How many kitkat codes did you enter in one hour:-? Vijay, lucky guy; Even i won this for yesterday lucky draw and today i got the confirmation call. These guys are giving new Nexus 7 (2013) or the old one??? hi ! Gopal what was the strategy you adopted while sending sms. I hope you will share your experience with us? i have won the prize too..........now in the NDC .....what all should i fill?......and is a revenue stamp necessary??? as u see.....i stay in karnataka.......after the telgi scam.....the government has banned use of stamp paper.......so is there any alternative? please specify what to fill under r/o?? ?......or is it what they ll fill when they deliver the prize?? r/o is Resident of (give your full address there) and you can get a Rs.1.00 revenue stamp in the Post office. I dont think they have banned revenue stamps. I checked today in a post office, they told that the govt. of karnataka has banned sales of revenue stamp in post office. please tell how all your friends won? Did they make only one entry? I am trying for past 6 days but did not get lucky? Can we send multiple entries? And I forgot to tell you that I have received only the first call yet. On 4 November. . And I am supposed to receive the ornery call on 6 November. Is 15 november the exact date when I will be receiving the nexus? Hi Vijay Prabhu, I too got selected for the Kitkat Nexus 7 Prize today. I got the first call as of now. The lady asked details like name,address,age and whether the phone number is registered on my name? She told that another call will be made within 48 hrs. I am delighted and waiting for my first android device! What are other formalities and docs to be sent? Please advise. 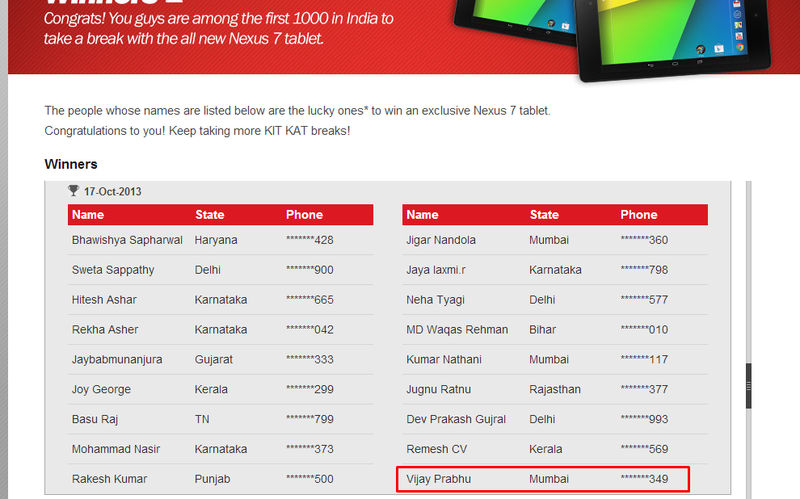 Congrats Vijay Prabhu and everyone who won the prized Nexus 7 tab (hopefully it should be the latest 2013 version). If it is, that will be a BIG jackpot. Now waiting for 2nd call and formalities.Send more smses and enjoy frozen kitkats! Congrats Vijay and Manu for the win... I also just sent an sms at 6:27 pm .. If the draw is done hourly I guess the winners will be announced around 7pm and not just after 10-15mins. Please wish me luck ..! :) Also Manu can you tell me what time did you send them the code sms and how many different codes did u send in an hour?? Thanks...! BTW Mr. Vijay I also wanted to know what was your 1st android win and which contest? (c) And Congrats once again..! Hi ! I too want to be a nexus winner. I am participating in the contest since 27th October and i am impatiently waiting for the time to come. Pls suggest how random should i send sms to get a high probability of winning? Just one per hour is a good method, as also said by Vijay Prabhu. The draw logic,i guess considers the location, time of day, mobile operator, big cities like mumbai etc. So try with one per hour and random usage of different mobile numbers! :) Best of Luck & Logic !! Multiple sms per hour from same number is not a good idea,i guess, because google would club the smses from same mobile number (in an hour) as single entry to give fair chance to everybody ! Thanks for registering. To win a Nexus 7 tablet, tell us what do you do to KIT KAT & world records? SMS KITKATA or B to 09880298802. Hope am answering correctly !!! I have tried by entering the code present in all 3 variants of kitkat but still no luck for me yet !!! (a) The Participant shall receive a question through a SMS which shall be sent by the Agency to the Participant’s mobile number. (b) If the Participant answers the question correctly, his/her entry shall be eligible to be considered for winner selection. Details on how this will happen are described under "Winner Selection". (c) However if the Participant answers the question incorrectly, his/her entry shall be disqualified and shall not be considered for winner selection. I sent one code at 10:03 am today also but still no luck.. Can all the winners here share me the exact time when the winning sms was sent, which carrier, prepaid or postpaid and which kitkat was used (4F,2F or Kitkat Dark) ?? I know i am assuming too much but hope it works. I sent the sms through my vodafone postpaid no. and used a Kitkat 4F. I got the call today, as I am from Bangalore I told the representative that I cannot paste a revenue stamp. To this he responded by saying that attach a letter stating this issue and send it with the rest of the materials and they will consider it. Dear Vijay where is it written that the tablets will be dispatched after 15 Nov and will arrive by 20 Nov. I am worried as I am out of town during that period !!! Just now received the email from Nestle with NDC and Form 60 docs. Vijay, I have confusion with the NDC.1. R/o should be? 2. have received the gratification “Google Nexus Tablet” on ………….. ? 3.Witness.......? 4. details......? please advise. Manu R/o is resident of : give your full address. received gratification put the date you were first called which I think is 6.11.2013. Vijay, I dont have to alter the NDC format right? I have to give my details r8?even witness details is required or what? You have to alter it :P make some space for your name, address etc. Hi ! pls tell me whether i should try sending sms during day in between 10 am to 7 p,m or from 7pm to 10 am. Thanks manu for all your tips.I am from kolkata which has few winners compared to other larger cities like delhi and mumbai.Also did all the winners receive the second sms or recieved the call without getting the second sms? Thanks Vijay,now I get it. Would there be any issue in a family member signing as a witness? Congrats Harish Goyal :) We have one more winner here. Did u receive the second sms ? manu your name was not on there???? send it(shud i send widout filling. 2.what is acknowledgement due & how should it b sent? 3. is 'Due' also required in courier? Regarding AD, dont worry about it, send the dox by courier. AD is a slip which is required when you send a letter by India Post. Can someone tell me whether the numbers are 011-30177200 or 30798150 from which the call from kitkat comes? Pls tell me as i have missed calls from these two numbers. as u see in stats, Karnataka is on Top and coincidentally the number 09880298802 is also a Karnataka Airtel number !! any logic behind it?? :-? Hi Jerry, According to the Terms and Conditions, the winners are selected via a draw through a random, scientific basis that is conducted each hour from amongst all valid entries received via SMS between 7pm of the previous day till 10 am of the next day during the Program Period. Also, as a process the eligible winner names are uploaded basis establishing contact with them. We do face delay in establishing the contact and hence only those names are updated on the winner section of www.android.com/kitkat wherein the contact has been made. Do visit our program website http://www.android.com/kitkat for terms and conditions. We thank you for the interest shown in our brand related activities and assuring you of our best attention at all times. Hi Praveen, We'd like to bring to your notice that the winners are selected via a draw through a random, scientific basis that is conducted each hour from amongst all valid entries received via SMS between 7pm of the previous day till 10 am of the next day during the Program Period. Pls Vijay explain the draw procedure? Vijay, have you received any confirmation about receipt at GroupM office of your DOX n wrapper and any info about completion of auditor verification of package?? we discuss that now ! Haha :)) Manu yes I received confirmation from the agency that is handling the contest on behalf of Nestle and Google. I received the following reply "We'll contact with you very soon for the confirmation your doc. & gift will be start to deleiver after 15 of Nov."
I cant give further details on that. Hi Vijay and Manu,i had sent the docs using speed post. What is acknowledgement due?? "(vi) The completed Participation Package needs to be sent by registered post with Acknowledgement Due or through courier to the address mentioned below so as to reach within 7 (seven) days of the call made by Agency:"
Registered Post is just "POST" plus consignment being recorded at various point until the destination. I was never so confident with Reg post even though it is very cheaper compared to couriers; so I sent through First Flight courier. I sent one evening and it was received in gurgaon office by lunchtime next day. it cost me Rs.117 to be exact. what can i do now sir?? Hi Rathin first let me congratulate you :) The second call may come today :P You have to affix Rs.1.00 revenue stamp on the NDC. You can send dox by any courier but try to send it by Bluedart as you can track the shipment. Thanks for ur reply. Got the call around 1hr back. He told me to get the xerox for v.id & pan card. I asked about the stamp. He said any amount of Rs.5 or Rs.10 stamp will do. pls tell me the Rs. amount in stamp does really matter? I have both stamp of Rs.1 & Rs.5; which one to put? Do I need to cross sign over the stamp? The address in RO has to be the same as V.Id? hi one more query; my v.id address is different where i m staying right now. but it's inthe same city, only bit different area. else pin no. & rest all the same. can i add my owned indane gas bill with v.id as the address prof? or this v.id will do? Did u get confirmation from kitkaat saying they have recieved your docs??? A mail or a call?? I wish i was at home, back in mumbai, probably i would have own by now. Still no luck. With just one day and three more wrappers left, i think chances are negligible. I was so hopeful that i will finally have an android. Hi Vijay. I got 2nd call on 7th, sent dox on 8th, dox recvd on 9th according to tracking, but still no confirmation as of now?? should I follow up? :-? thanks. There are lots of complaints by winners on Kitkat official facebook page about package not been received or similar problems. should we be worried? Vijay, there's slight confusion here. Do they or do they not give any intimation about receipt of DOX?, as some winners have reported that the agency contacted them about non-receipt of dox?? The agency company is having different offices on different floors. When I called up to confirm their contact number, the guy on some other floor did not have any clue about what I am talking (kitkat competition). It would be helpful if we get a direct contact number for enquiries. Will I be getting any intimation from Nestle after they have received the participation package that I have sent. 1. Call 0124 4519300 and ask the operator to forward call to Ms subarna Nandy and ask her directly all your queries. DOX Not Received - They CALL ! They call in case they don't get your documents. If call doesn't come this is itself a confirmation guys. conhrats to all the nexus 7 winners. To all winners and blog readers, if you have send the dox by Courier (Bluedart preferred) or Registered Post AD of India Post you need not worry about confirmation. If you have sent it through Speed Post you can send the documents against along with the wrapper photocopy (if available) by Courier (remember courier this time) if Nestle emails you the request or calls you back. Is there LTE in 16GB version? Mumbai is surely closing in.there could be a rush in next 3 days! Yes Manu right on the button :d One more thing, there is a severe shortage of KitKat pack having Android images in Mumbai, are you facing same kind of problems ? Yes Indeed, I thought I should try for my dad again,but yesterday the shop had all regular kitkats ! You r r8, there is shortage! So far Total 694 Eligible winners ! some (names + state + phone nos) have got multiple Nexus 7 ! Do we get a confirmation SMS that i have won instantly or just directly get a call? the draw will be at 11 am so will i get a message stating u have won at 11am or later?? Today I got one missed call from +91-120 247 5300, Is this the number; they used to call? so does it mean that after we send the dox there would b no response from nestle? then how will we come to know when they r sending the tablet? I believe if our DOX are received at agency office then we won't be called and hopefully we would get Nexus 7 in time. If you see this blog and facebook kitkat page, winners are reporting calls received by them only when there is non-receipt of DOX. I haven't received any call after yesterday's missed call from 120 247 5300.. And I also haven't received any message saying that You have won Nexus 7..
Is there any way through which we can contact them.? If you have not received any message saying that "..will contact you in 24 hrs" means you have not yet won. calls come only after that message. the SIMs used were different bt registered wid same person. If u see the kitkat dot in website,you will find some winner names who have won multiple nexus 7. If you search through it, you will find the winner (name+state+last 3 digit phone number) is identical. So we should conclude that your friend is going to get 2 Tabs. what is the answer i suppose to send for the question "Thanks for registering . to win a nexus 7 tablet , tell us what do you do to kitkat &world records? And they are not updating their website from past 2-3 days....Any idea why?? The website may not have been updated due to various reasons, one of them is non confirmation of winners with second call. May of us live in remote places where there is network problem. Vijay is this contest fake or something. lyk why would google go for such a loss. Even if we assume there are total 5 million promo kitkats in India X Rs.10 = 50 Million Rs. (5 crore Rs) + SMS charges (5 crore Rs) = = Rs.10 crore. Now Nexus giveaway would cost them about (790 X Rs.15000)=1.18 crore Rs. So who's gaining? is the contest live on 15th nov i.e tommorrow. lyk can we send codes on 15th as well i.e from 10am to 7 pm or the contest ends today itself.?? Vinit the contest is live as of 15th till 12.00 hrs midnite :) and the same timings are applicable i.e. 10 am to 7 pm. Google may require additional 7 days to receive all the documents sent by the contestants who win on 15th. I am also a winner of Google Nexus 7. I received the call on 30Oct, sent the docs on 31 Oct, and it reached Gurgaon on 2 Nov (checked through tracking). But I had sent the docs through speed post (bcoz I had asked the person who informed me if we cud send through speed post, and he said yes). I haven't yet recieved any confirmation. I followed through email but still got no reply. Is there a chance of me not getting the prize? Is the LTE/4G only available in 32GB version?any info? Any idea when google is releasing Nexus 7 in India?? It was supposed to be this month. Did you Receive confirmation from Kitkat after sending the docs??? and dont forget after receiving d dox, their audit team will verify. so doesnt mean sending dox u r entitled to get d nexus 7.
they have some drama about dox receiving as experienced by few users. Call this number for confirming whether courier received or not in gurgaon office? 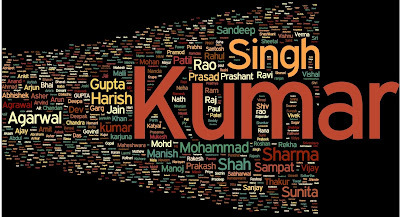 Here's a Tag cloud image of the Kitkat Nexus 7 Winners ! 1 & half months to reach? ?wt the hell . so long .vijay is the anon saying right?? did u receive any confirmation from kitkat"? ?.....after sending the docs?????? just relax and don't stress on winning it. Just send the code as if you don't want nexus and forget about it. How can i check my name on that site??? ?what is the website?? ?